It's time for a role playing game adults and kids can both enjoy. 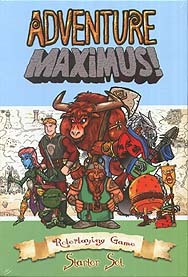 Adventure MAXIMUS! is a card based, introductory Role Playing Game for players 8 years-of-age and up. Players can take on roles from different races and classes. Working together as a famous "Adventure Company" based in the fantastic, post-apocalyptic world of Ex-Machina they can become heroes of legend.